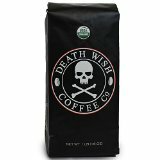 Death Wish Coffee for Crazy Coffee People! Have you ever wondered what could be the best coffee in the world? Many argue that Death Wish Coffee, a blend between organic arabica and robusta, the premium is considered ' deadly ' '. It is all a matter of preference. The best tasting coffee may be coffee you home roasted as it is super fresh, compared to packaged stuff you get on store shelves. Yes, we have heard of this coffee, but it seems that it is more of a novelty name for a coffee than a SUPER caffeinated coffee. You could just add a shot or two of espresso to any coffee and get really high levels of caffeine. The packaging does look really, um, deadly.